Today, restored mid-century modern Alexander homes in Palm Springs, depending on the neighborhood where the home is located and the quality of the updates, sell for prices ranging from the mid $500,000s to prices of up to $1.5 million. The Palm Springs neighborhoods where Alexander homes were built between the years 1957 and 1960 include Twin Palms, Vista Las Palmas, Sun-Mor estates, Little Beverly Hills, and the Racquet Club Estates area neighborhood of Palm Springs. Each neighborhood has its own price ranges mentioned below. The desirable Twin Palms neighborhood, officially known as Twin Palms Estates, is located in south Palm Springs (south of highway 111, west of Sunrise, and east of Camino Real Streets) is the first Palm Springs neighborhood where Alexander homes were built during the years 1956 and 1957. These mid-century homes were built directly south of the Ocotillo Lodge, the first Alexander construction project in Palm Springs, a hotel-resort that is now operated as individually-owned condos, some rented seasonally with others home to year-round Palm Springs residents. Twin Palms Drive is the entrance to the two tracts of Alexander homes built in Twin Palms. These Alexander homes are about 30% larger scale than the 1,225 square feet Alexanders built in the Racquet Club Road area, though the floor plans are nearly identical, just larger scale. The lot sizes of Alexander homes are very spacious and private, fairly uniform and approximately 100 x100 square feet lots, nearly one-fourth acre each. 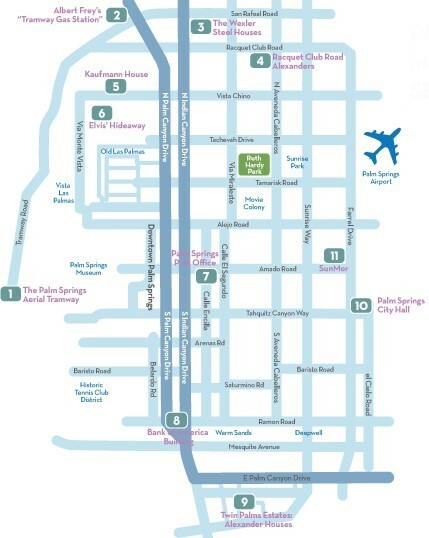 Convenient both to downtown Palm Springs and with easy access to highway 111, also known as east Palm Canyon Drive, the Twin Palms neighborhood is located south of Hwy 111 (E Palm Canyon Drive), east of Camino Real and north and west of LaVerne Road. Twin Palms is north of Canyon Country Club estates in South Palm Springs. Alexander Homes in Twin Palms sell in the price range of $600,000 (fixers) to $850,000 (nicely restored and upgraded). The Racquet Club Road estates area of Palm Springs is the neighborhood in Palm Springs where the largest numbers of Alexander homes were constructed in the years of 1959 and 1960. These homes were all built on generous sized lots of one quarter acre or 10,000 square feet and were uniform in size with 1,225 square feet of living space. The Racquet Club Estates Alexander homes are also are the most affordable of the Alexander homes and many of them are used as weekend vacation homes. There are more than 300 Alexander homes located in the Racquet Club Estates section of Palm Springs, considered north Palm Springs area, north of Vista Chino and East of Indian Canyon Drive. Many of the homes are located on and north of Racquet Club Road, thus the name “Racquet Club Road estates” for this neighborhood of Palm Springs Alexander homes for sale and for rent. Many Alexander homes located in the Racquet Club area are fixers and are available for sale priced between the high $300,000 range, with most of the homes selling in the $500,000 to $700,000 price range, depending upon the condition and location of the property. Vista Las Palmas, a Palm Springs neighborhood that consists mostly of Alexander homes built in 1959, is one of the most desirable present-day neighborhoods of vintage Alexander homes in Palm Springs. ated in Vista Las Palmas, west of downtown Palm Springs. Vista Las Palmas is located directly west of Palm Canyon Drive and west of Monte Vista St, tucked against the gorgeous San Jacinto Mountain range. In the Vista Las Palmas neighborhood of Palm Springs, where the largest and most luxurious of Alexanders were built as the second cluster of Alexander homes, Alexander homes start at about $950,000 for fixers and up to $2 million or more for exquisitely updated and upgraded Alexander homes. A vacant lot in this premium neighborhood, though rarely available, commands a price in the range of $800,000 to $1,000,000 or more. Alexanders in Vista Las Palmas were among the largest built, starting at about 1,600 square feet, similar in size to the Twin Palms neighborhood Alexanders. (The adjacent bordering neighborhood of Old Las Palmas is home to many of Palm Springs most luxurious estates featuring large private gated grounds for each of these custom built homes built from the 1920s to current day. There are two Central Palm Springs neighborhoods of Alexander homes – one called Sun-Mor estates, nicely done Alexander homes sell in the price range of $500,000 – $700,000. The other neighborhood cluster of vintage mid-century modern Alexanders is located in central Palm Springs south of Ramon Road and west of El Cielo, near the Bel Air Greens and Mesquite Country Club Golf Courses. This area of Alexander homes is a lesser known area and a smaller cluster of Alexanders (84 homes). This area is known as Little Beverly Hills because the streets in this neighborhood are named similarly to many of the streets in Beverly Hills, Ca. DEEPWELL is one of Palm Springs’ historic neighborhoods blending great mid-century modern design, magnificent mountain views, and quiet elegance. Deepwell is located in the charming and serene south end of Palm Springs with homes that feature well manicured yards, beautiful soaring palm trees, and well organized streets. Deepwell features a great variety of customized California ranch homes with an excellent location less than 5 minutes to downtown shops and restaurants. Midcentury modern homes in the Deepwell neighborhood of Palm Springs Ca include a great variety of custom built California ranch style homes with low slung rooflines, spacious floorplans, great character including impressive fireplaces, terrific pools, and generous sized private lots. The Deepwell neighborhood was the home to such stars as Jerry Lewis, Jack Webb, William Holden, and singer Julie London. Deepwell’s stylish homes are on commonly on generous lots and there is something about Deepwell’s understated flair that beckons one to relax, take in the scenic Mt. San Jacinto views, and enjoy the good life.